With colder weather approaching (and in some places here already), a sleep sack or sleeping bag is a must have for a little baby! We used them with our first when she was a baby and are using them with our second now. They are so cozy, safe, and warm and come in varying weights and sizes. It is really important that it is made of natural materials, as it is right next to baby's body. We have various sleep sacks/sleeping bags that we love, one of them is the ErgoPouch. I bought their 3.5 Tog (Tog is a European rating for the level of warmth and it has corresponding safe temperatures, the higher the number the colder it is meant for) with our first in the 12-36 month size, as we needed something very warm for her in a larger size than what we had. It was great, easy to wash and dry, super comfortable and nice and warm without causing any overheating. We used it for I think about 1.5 years and had to size up when she was 2.5 because our daughter is very tall. ErgoPouch is one of the only companies I could find that makes their sleeping bag in size 3-6 years, and it is organic and reasonably priced! Recently Ergo Pouch sent us two new sleeping bags in the 2-12 month size to try out with our new baby. This one is the 2 in 1 ErgoPouch Winter Sleepsuit Bag, 2.5 Tog in mint. It transitions from a sleeping bag or sleep sack to a sleeping suit, with two enclosed legs. It also has soft and stretchy organic cotton fleece arms, so baby is all covered, nice and warm. 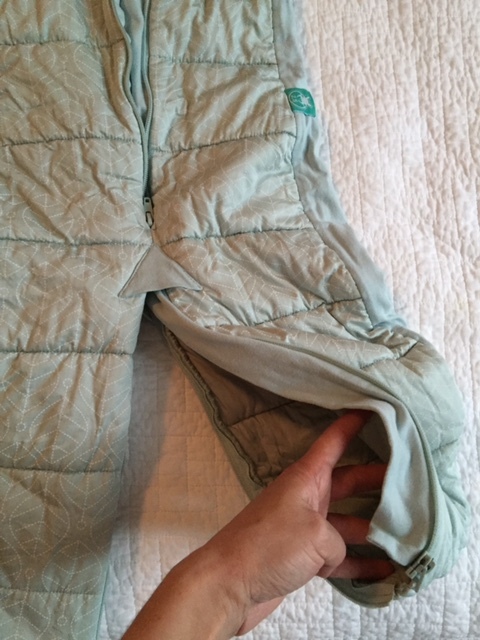 It is great in and of itself as a sleeping bag, especially because of the sleeve feature, but the zipped leg option makes it practical for various settings. Here our baby is in the Baby Bjorn Bouncer chair with each leg zipped up. The quality of their sleeping bags is great and I love that they also use organic cotton on the outside with 100% cotton fill. It is pretty easy to transition from sleeping bag to sleep suit, you just unzip the center zipper and zip the legs together. So, it could be done with baby sleeping, of course it depends on the situation and the baby! It is very soft on the inside, the fleece, the cotton and the seams! It is also a good choice for baby's who have sensitive skin. We love this sleeping bag! We also have the 1.0 Tog Spring/Autumn Sleeping Bag. Even though it might not be as cold, I still want our baby to be covered with something and it isn't safe to use a blanket and footed pjs don't seem warm enough. I really can't imagine not having a sleep sack for a baby, I think it is an essential item! This 1.0 Tog Sleeping Bag is made of two 100% organic cotton outer layers and a bamboo fleece inner layer. All of ErgoPouch's sleeping bags have stretchy seams for easy movement and to protect baby from zippers. They also have double ended zipper access so the sleep sack can be open at the bottom for changing diapers or slightly open for a little airflow. The little covers for both ends of the zipper are a nice touch and help eliminate any rubbing against the zipper on baby's skin. Each sleeping bag and sack has the Tog rating sewn on the outside, so one does not have to remember what it is, it is very clearly labeled. Their prints are playful, elegant, and very sweet to look at. Also I appreciate that they are somewhat muted and gender neutral overall. We especially like the stretchy sides and shoulders. Our baby sleeps really well in these sleep sacks! Thank you ErgoPouch for asking me to review these sleep sacks. I already loved your products and I am even more a fan of your products after trying these two sleep sacks on our little one. Pictured here she is 3-4 months old and this size fits perfectly.